Community Gardens have received funding through the Live Here Love'Here Small Grants Scheme. Live Here Love Here have given groups a little more time to apply to the Small Grants Scheme, by extending the deadline to June 28 at noon. If you are part of a group or organisation who are committed to improving your local environment and building a sense of community pride, you can apply to the Scheme. Live Here Love Here is a partnership with local councils, the Department of Agriculture, Environment and Rural Affairs, Choice Housing, Northern Ireland Housing Executive, McDonald’s, Coca Cola and Keep Northern Beautiful. 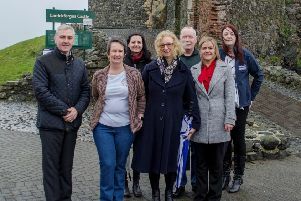 The Small Grants scheme provides support to volunteer projects that: Use innovative ways to reduce littering and dog fouling; Improve the way the local environment is looked after, whether urban, rural or coastal; Contribute to the development of civic pride within a community with a focus on environmental improvement; enhance or attract tourism to your community through environmental improvements. Grants are available from £500 to £5,000 and are open to volunteer and community groups, all school and third level education organisations, youth groups and sports clubs undertaking civic pride projects in supporting Council areas and also to all Housing Association and Housing Executive residents. Last year, £109,000 of funding was made available supporting 78 local community projects. For more information on the Small Grants Scheme and to download an application form please visit www.liveherelovehere.org or contact Keep Northern Ireland Beautiful on 028 9073 6920.